Are you tired of suffering from neck and shoulder tension every time you travel or use a computer? 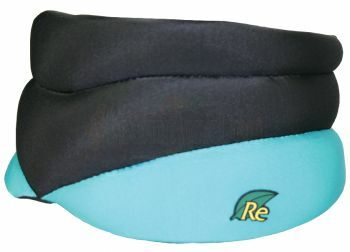 Releaf® is an innovative and patented neck rest that provides a delightful lifting sensation by temporarily supporting the weight of your head. When your head remains in a static posture for a prolonged period of time, your neck and shoulder muscles often become tense. This happens because your neck and shoulder muscles are exerting extra effort to counteract gravity’s pull and keep your head upright. This muscle tension is often further compounded by improper posture. For example, continuously and habitually craning your neck forward (common during computer use) or sleeping with a crooked neck (common during travel) will often lead to neck and shoulder tension and pain. Releaf® keeps your head and neck in good posture by supporting your head’s weight (which can be up to 12 pounds) and allowing your neck and shoulder muscles to relax. Releaf® helps your neck and shoulder muscles relax by temporarily supporting the weight of your head. Releaf® incorporates a patented flex-tension response that acts like a built-in spring to provide proper support for your head. This unique feature also allows Releaf® to conform to the shape of your neck for a comfortable fit. Releaf® neck rests are made of polyurethane covered with nylon/spandex.Releaf® is durable, lightweight, and flexible, making it easy to carry and pack. Large Size: 15.25" - 17.25"
*This product is not a medical device. It is not intended to be used for the treatment of neck injuries, pain or alignment problems. It should not be used while driving or during other functions where head movements are necessary. how tall is it 4" from under chin to collar bone? From under chin to collar bone, the Caldera Releaf® Neck Rest is about 3 1/2". Thank you for your inquiry to 4Luggage.com and have a great day. The full manufacturer's warranty from Caldera is only valid when the Caldera Releaf Neck Rest is purchased from an Internet Authorized Dealer. We will match any Internet Authorized Dealer's best price on the Caldera Releaf Neck Rest. The Caldera Releaf Neck Rest may be referred to by the following terms: 679090230026, REL200.